and A More Perfect Union, a collaboration with guitarist Lorre Wyatt. 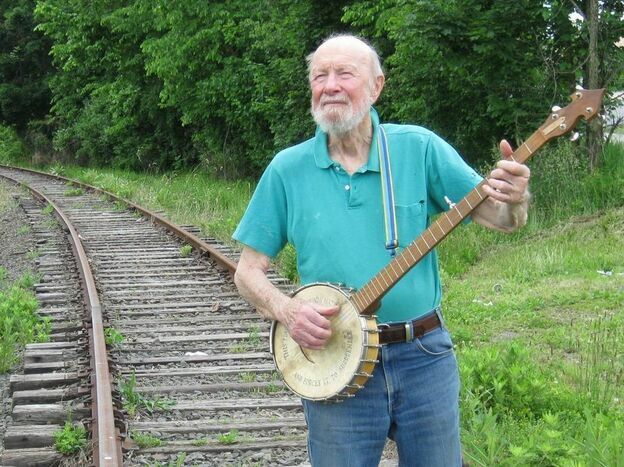 As he often does when the weather's decent, Pete Seeger recently played a free show outdoors in Beacon, N.Y. A few dozen people packed around the stage that held Seeger, his ever-present banjo and a small band; a group of kids in red T-shirts clustered down in front, singing along. The emcee for the afternoon was Susan Wright, the music teacher at Beacon Elementary School, where Seeger visits regularly. "Friday, he came in and we worked with the kids," Wright says. "He's kind of like having a great elder musician-historian come to visit — a combination grandfather and Santa Claus, but really skinny. They know, when he comes, we're gonna sing together. We're gonna do stuff together. They really get him." Seeger shows off his banjo, inscribed with the message, "This machine surrounds hate and forces it to surrender." Seeger has been singing for anyone who'll hear him throughout what he refuses to call his "career." There's good reason for that, says David Bernz, who produced two new Seeger albums. "Almost every time that Pete interacted with the mass media, on some level they spit him back," Bernz says. "The Almanacs [Seeger's 1940s folk group], they got on the radio, and then immediately, people criticized their politics and they were off. The Weavers were on the radio; they got blacklisted. He gets a Columbia Records contract, but then he finds out they're keeping his records in the warehouse. The Smothers Brothers want to edit him out. "The great thing about Pete is ... he would never let that stop him," Bernz says. "He sang at every little church, little school, summer camp, gathering — year in, year out, to kids and adults alike. And when you look back on it after these decades, you realize that Pete has been heard." Tall and lean, in faded Levi's and corduroy shirt, Pete Seeger still pretty much looks like he did when the young Harvard dropout met the man who helped him find his life's work: Woody Guthrie. 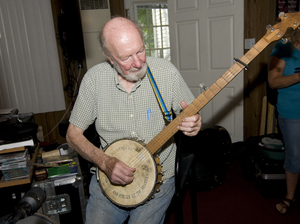 "I was working in Washington, D.C., at the time with Alan Lomax, the folklorist," Seeger says. "And in Alan's house I met Woody, and he found that I could follow him in any song he played. I had a good ear and I stayed in tune, played the right chord, didn't play anything too fancy. So pretty soon, I was tagging along with him." Seeger says Guthrie taught him not only lots of songs but also how to play in saloons, get paid first, how to ride the rails — carefully — and that no matter the consequences, to stick with your beliefs. In a spoken-word track on his new Guthrie tribute album, Pete Remembers Woody, Seeger tells the story of Guthrie's famous slogan. "He went through WWII with a piece of cardboard pasted to the top of his guitar: 'This machine kills fascists,' " Seeger says on the recording. "He really wanted his guitar to help win the war against Hitler. When Woody went into a hospital in 1952 ... I put something similar on my banjo: 'This machine surrounds hate and forces it to surrender.' "
Seeger has written that on every banjo he's had since then, including the one he used to compose the tunes on his other new album, A More Perfect Union, which features the guitarist Lorre Wyatt. 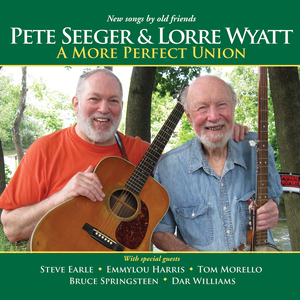 Seeger and Wyatt's collaborative album, A More Perfect Union. "I occasionally get together with a good songwriter and work with him or her, because I can't do what I want all myself," Seeger says. "I knew Lorre Wyatt when he was in his early 20s." Wyatt is now in his 60s and occasionally makes the four-hour drive from his home in Massachusetts to Seeger's place, which overlooks the Hudson River. He recalls the genesis of their recent collaboration, a phone conversation in which Seeger unwittingly spun a poetic line. "Pete called up one time — this was a couple winters ago, when it was a really hard winter and [he was] running low on wood," Wyatt says. "He said to me, 'The elm, you skip; it's the devil to split. Stick with maple, ash and oak.' And I grabbed my pen, and we continued to talk about wood." Like the wood Seeger still splits, most of the songs he's written come from his life. On the new album with Wyatt, there's one about cats howling for their supper, a song about old apples, and another another about the Hudson River, whose preservation has become Seeger's latest cause. Though his voice is a little lower now, the key to the songs remains the same: Make the lyrics accessible, and try to keep the words no more than two syllables long. "We'd like people to sing our songs. We don't want a melody that's so difficult, an ordinary person couldn't sing it," Seeger says. "I think Lorre and I would agree 100 percent on that."